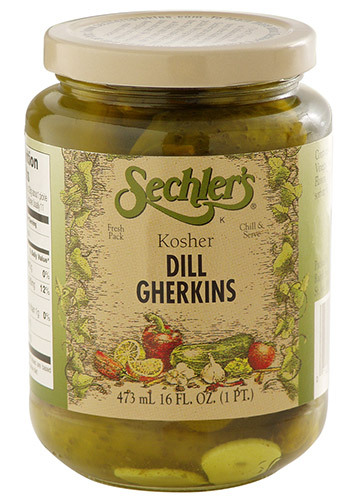 16 ounce Kosher Dill Gherkins are our smallest whole dill pickle. This terrific pickles are made with the fresh pack process and are Certified Kosher. Garlic, Natural Flavors, Turmeric and Polysorbate 80. From Karyn of Urbandale, Iowa on 12/27/2018 . Me and my family have been ordering Sechler pickles for a long time, since the beginning. When I lived in Chicago to when I lived in Iowa. I can only image how many pickles we have personally purchased and consumed over many, many years, also ordering them for gifts for loved ones and even clients. Customer care is at a new low and it's a shame I will move on to one of the many other speciality pickle companies that have popped up like gang busters. Shame. From Noreen Mitchell of Portage , Indiana on 3/26/2017 . Only Pickle daughter and son in law love, you make it easy for me to be the hero and get it for them every now and then. From Jenifer Kuhns of Goshen, Ohio on 7/18/2016 . Pickles are delicious. However, I believe them to be overpirced. $28 plus $15 shipping for 6 jars is a bit of a rip off. The labels on jar indicated each was 64 ounces (when really only 16). When visiting northeast Indiana we bought a true 64 ounce jar for $10.99. If you don't mind over paying for these pickles they are very delicious ! From Anna Osborn of Houston, Texas on 4/8/2016 . From Richard Wickboldt of Ann Arbor, Michigan on 3/11/2016 . Whenever I am looking for the best pickle or relish. I turn to Sechler's and each time I am totally satisfied with the quality and savory taste. Always the best! My local supermarket here in Ann Arbor MI Hillers had Selcher's products on the shelves. Well they sold out to Kroger who doesn't carry their products. Sure wish they would. I have to order on line to get what I need.